Zion Mennonite Church, July 2017. The Zion Mennonite Church, a southern Manitoba congregation, grew out of the Old Colony Mennonite Church of Manitoba in November 1980. Its charter membership of 156 included two ministers, Wilhelm Thiessen and John Wiebe. The congregation built a new house of worship at Schanzenfeld, south of Winkler in 1981. Henry K. Schellenberg, Chortitzer Mennonite Church elder (bishop), served the Zion congregation with baptism and communion until March 1982, when Wilhelm Thiessen was chosen as the first elder. Henry Wall and Frank Unrau became ministers in 1981 and 1985 respectively. In 1987 the congregation numbered 256 members and 161 unbaptized children; Sunday school enrollment was 150 (ages 3-16), and 70-75 young people attended an active youth organization. In 1995 the congregation joined the Chortitzer Mennonite Conference. Mennonite Weekly Review (7 March 1984), 5. Mennonite Reporter (9 November 1981): 1. Petkau, Irene Friesen. Blumenfeld: Where Land and People Meet: 47-48. Zacharias, Peter D. "Zion Mennonite Church (Schanzenfeld, Manitoba, Canada)." Global Anabaptist Mennonite Encyclopedia Online. 1990. Web. 20 Apr 2019. http://gameo.org/index.php?title=Zion_Mennonite_Church_(Schanzenfeld,_Manitoba,_Canada)&oldid=149074. Zacharias, Peter D. (1990). Zion Mennonite Church (Schanzenfeld, Manitoba, Canada). Global Anabaptist Mennonite Encyclopedia Online. 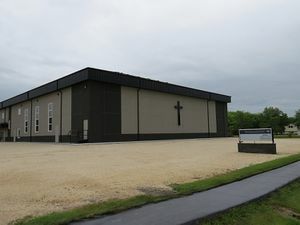 Retrieved 20 April 2019, from http://gameo.org/index.php?title=Zion_Mennonite_Church_(Schanzenfeld,_Manitoba,_Canada)&oldid=149074. This page was last modified on 18 July 2017, at 16:29.